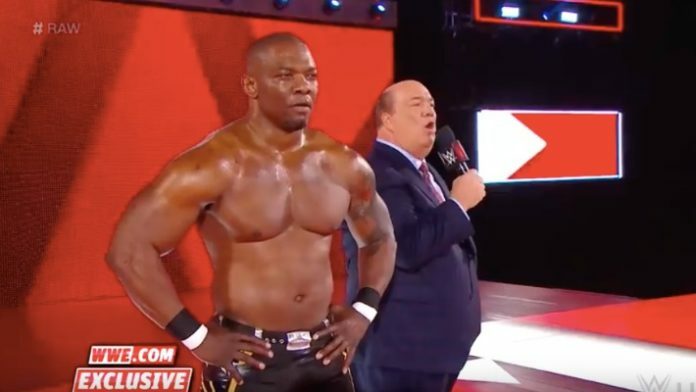 Paul Heyman listed Shelton Benjamin as Brock Lesnar's "Assistant Coach"
Shelton Benjamin attacked Seth Rollins last night on RAW. His actions led to a match between the two competitors. WWE has recently posted what happened during the commercial break which led to Benjamin and Rollins having a single’s match. During the segment, Benjamin was named as Brock Lesnar’s “assistant coach.” Heyman also referred to him as Lesnar’s former training partner. Rollins said that the Shelton Benjamin he knew wouldn’t hit and run but rather stay and fight him. 43-year-old Shelton Benjamin was first brought into Ohio Valley Wrestling nearly 20 years ago. He made his main roster debut alongside Charlie Haas as members of Team Angle in 2002. After his 2010 release, he signed with NJPW in 2012. As a part of Suzuki Gun, he left NJPW with the faction for Pro Wrestling NOAH in 2015. Benjamin re-signed with WWE in 2017. He’d been on the shelf for about a year following surgery to repair a torn rotator cuff. Benjamin was an All-American at the University of Minnesota in 1997 and 1998. He and Lesnar won the OVW tag-team championships 3x. Benjamin is a former 3x Intercontinental champion, 2x WWE tag-team champion (along with Charlie Haas), and a former 1x United States champion.